This Helix Patch uses the mimics the guitar tones from the song Love So Great by Hillsong Worship, utilizing snapshots for different song sections. You get two versions of the patch – one using IR Cabs (IR’s not included), and one using stock Helix cabs. In this demo Brian is playing a thinline tele with Porter 9T pickups. This video is demonstrating version 1.0 of this patch. We’ve made significant updates for version 2.0 – see the changelog below for more info. 1. 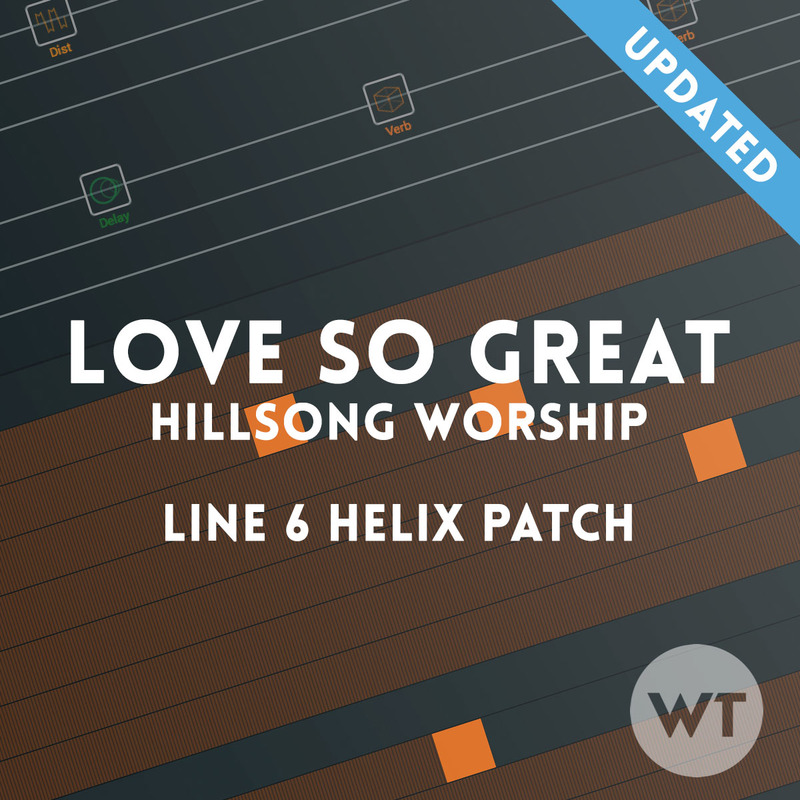 UPDATE YOUR FIRMWARE: Please upgrade the firmware on your Helix and the HX Edit software from Line 6 to the latest before installing this patch. Even if your Helix is up to date, the ‘HX Edit’ app needs to be updated as well. 2. REVERBS: The 2.6 Firmware update changed the mix levels of the new (HX) reverbs. This patch accounts for those changes, so if you are not updated to 2.6 or later on your Helix, the reverbs will not sound right. 3. IR CABS: This download contains both stock and IR cab versions. We think they both sound great, but if you’d like to use the specific IR we used, it’s from the ATyp 2×12 IR Set from Live Ready Sound available here. SNAPSHOT 1: INTRO/VS. Mid drive tone for the intro and verses. SNAPSHOT 2: PRE-CH. More drive and rhythmic delay. SNAPSHOT 3: CHORUS. Big rhythm tone. SNAPSHOT 4: BRIDGE. Rhythm tone for the bridge. SNAPSHOT 8: SWELLS: This tone isn’t technically in the song, but it’s nice to have available. KWB Drive – not mapped to a switch. This is an alternate overdrive that you can use how you’d like. We dialed it in to it sound great with this patch. Cali Graphic EQ – Always on EQ – Use this EQ to make tonal tweaks for your guitar/setup. These controls will affect your tone differently than the amp controls. See below for recommended settings. Looper (6 switch) – mapped to button labeled ‘Looper’. If you prefer the 1-button looper, feel free to substitute it – just make sure to use the stereo version. This patch is meant to be used in snapshot mode, but can be used in stomp box mode. We recommend setting up your Helix to use all ten stomps (stompbox mode) or all eight snapshots (snapshot mode). The Helix LT does not allow 10-button stomp mode, so you’ll have to re-arrange the button assignments to suite your preferences. Everything after the cab block runs in stereo. The delays are mono, but they are panned using the mixer block. All the verbs and effects after the delays are stereo effects. If you are able to run stereo, the wet effects will sound bigger and better. If you only use the L/Mono output of the Helix, everything will be summed to mono automatically. NOTE: Do not use just the Right output of the helix – some of the delays will not be audible if you do this. Feel free to stack drive pedals for bigger sounds. All three one at once will give you a lead/solo tone. The dotted 8th delay is in parallel with the quarter delay and 1/8th delay, so they’ll be more rhythmic when used together. Big ambient swells with tons of delay and reverb. All guitars are different, so you may want to make changes to suite your playing style and guitar. We set this up with a variety of guitars, including both single coils and humbuckers (primarily a Telecaster style guitar). If you have higher output humbuckers, you might want to make adjustments based on the suggestions below. We recommend making a copy of the patch and changing the copy just in case you want to revert back to the original. The version of this patch you initially download is voiced more toward single coils. We built it primarily using a Telecaster style guitar. If you have a humbucker equipped guitar with low-output humbuckers, it should be perfect for your uses too. Feel free to adjust the amp EQ and the settings of the Cali Q Graphic block (at the end of the patch) if you’d like to make the patch a bit brighter or darker. “Ch Vol” control on the amp module. This will increase or decrease volume without affecting the tone of the amp. This is the primary level adjustment tool I use for changing patch volumes. Output block level. Changing the level control on the output block (the very last thing in the signal chain) will increase or decrease overall volume. We typically have this set at zero, but feel free to adjust this as you see fit.